Established in 1990, Lastec was the first company to successfully engineer an articulating, contouring, rotary mower for golf courses to cut rolling turf without missing or scalping grass. 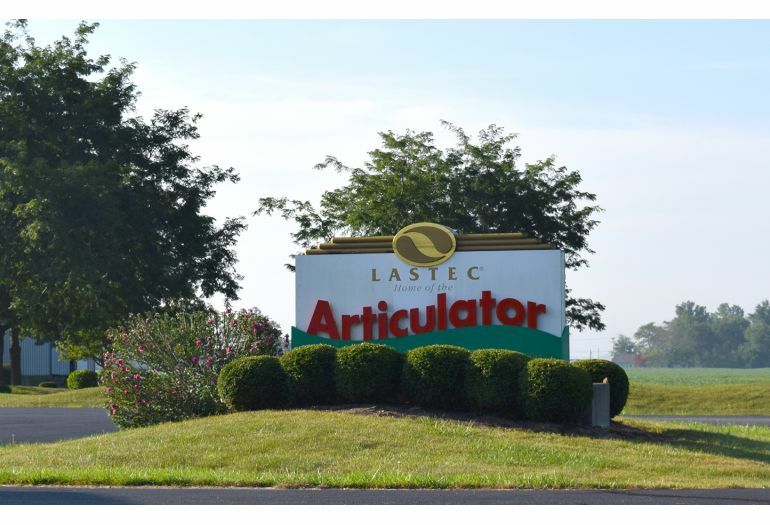 Today, Lastec manufactures a wide range of turf and lawn mowing equipment from their world headquarters approximately 30 miles west of Indianapolis. For more than two decades, the company has relied on MetalMizer bandsaws in order to produce specialty, high-quality components for their mowing equipment as well as for research and development needs in expanding their product range. The first articulating rotary mower from Lastec was developed on a rolling golf course in Southeastern Indiana by engineer Dan Tekulve. 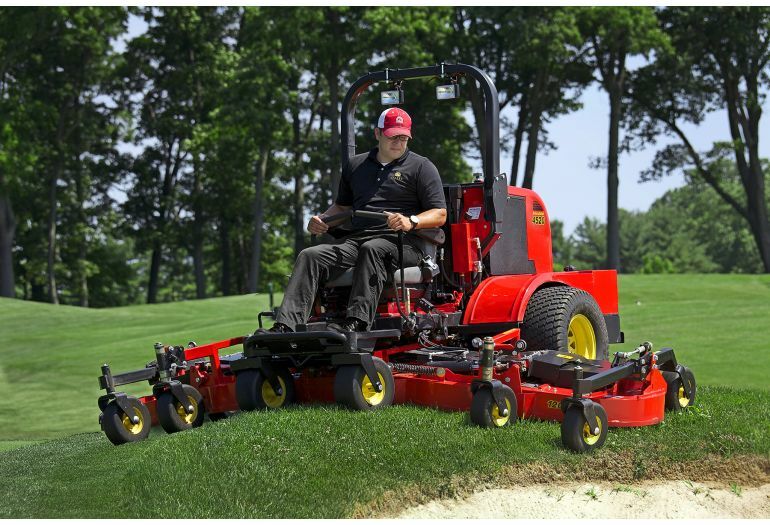 Searching for a cost-effective and quality solution to maintain mounds and valleys with a single machine, Mr. Tekulve developed a terrain hugging unit that featured seven 21” rotary mowing decks attached to a frame and pulled behind a tractor. The original mower cut ten feet wide as accurately as seven small push mowers with each floating deck driven by a belt transferring power between them. The revolutionary “Articulator” from Lastec was born. Throughout the past 25+ years, Lastec has expanded into more products that includes self-contained lawn mowing units for residential and commercial use as well as pull behind and out front decks for use on high-profile machines including Kubota, John Deere, Toro, and New Holland to name a few. Producing more than 40 different models, Lastec has established itself as a key player in the industry with more than a fourth of the world’s top 100 ranked golf courses, including St. Andrews and Pebble Beach, and half of Tournament Players Club (TPC) golf courses relying on Lastec equipment. 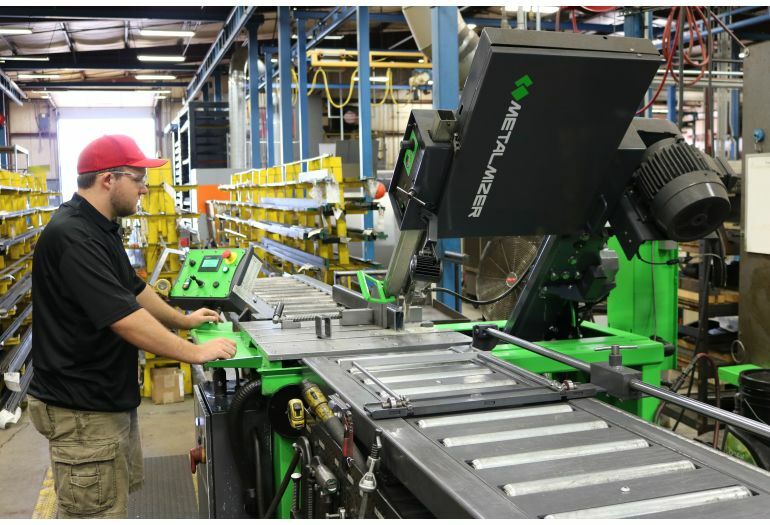 Lastec manufactures all of their turf equipment from raw steel to final assembly at their Indiana headquarters. 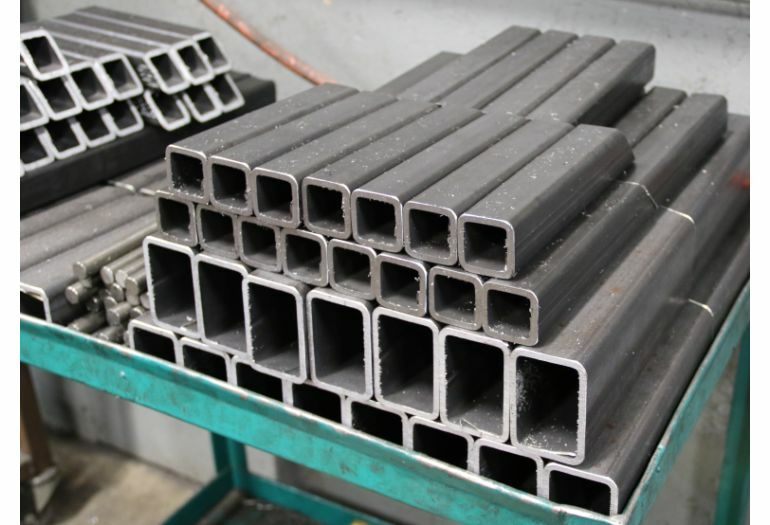 Their in-house fabrication department is able to laser, bend, turn, machine, and saw parts to specification before being welded, painted, assembled and shipped throughout the world. Machines vital to manufacturing Lastec’s high quality turf equipment includes multiple cut-off saws, press brakes, and machining centers, but MetalMizer bandsaws have remained consistent contributors to the operation for more than 20 years. 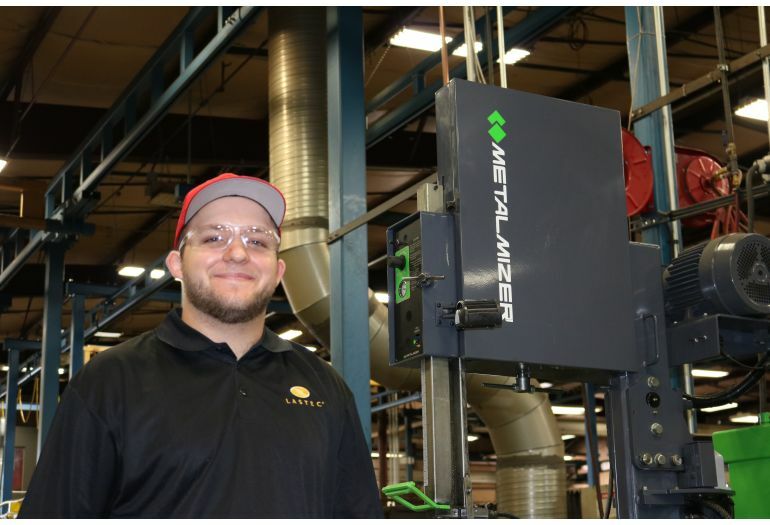 “The MetalMizer is a great, versatile saw for smaller shops that don’t need all the electronics or automation that drive up the cost of the machine,” said Nathan Beavers, Lastec Weld and Fabrication Manager. Using multiple MetalMizer machines throughout their history, Lastec currently operates with a newer model MetalMizer MV2300 saw for specialty fabrication of parts for their turf equipment line and a MetalMizer MV2018 saw to handle one-off cuts for their research & development needs. The Indiana-manufactured MetalMizer bandsaw got its start because hands-on fabricators wished their own cut-off saw would tilt a little bit forward, cut at a 45 degree angle in either direction, had finite adjustments on the feed force, and could offer all of this without extra bells and whistles. They ended up manufacturing their own saw and called it the MetalMizer. Since its inception in 1985, MetalMizer saws have fulfilled fabrication, production, maintenance, and R&D needs for manufacturing companies around the world including Lastec. 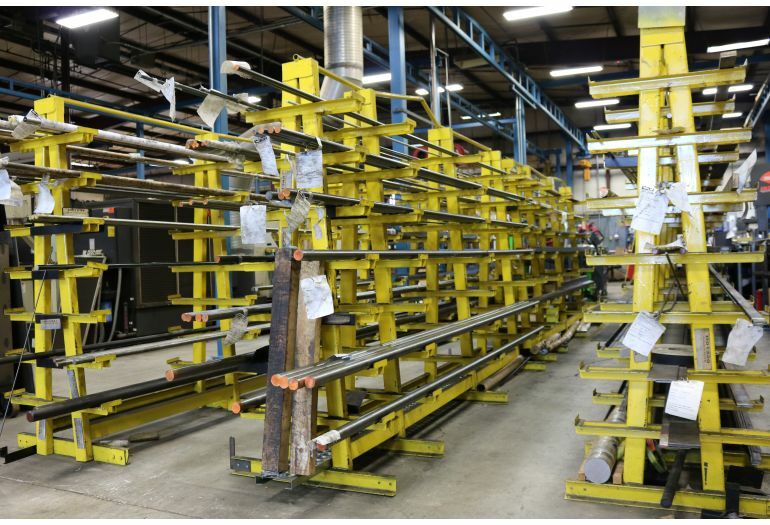 The manufacturing process for Lastec begins with raw steel staged for an automated cut-off saw and the MetalMizer MV2300 saw. 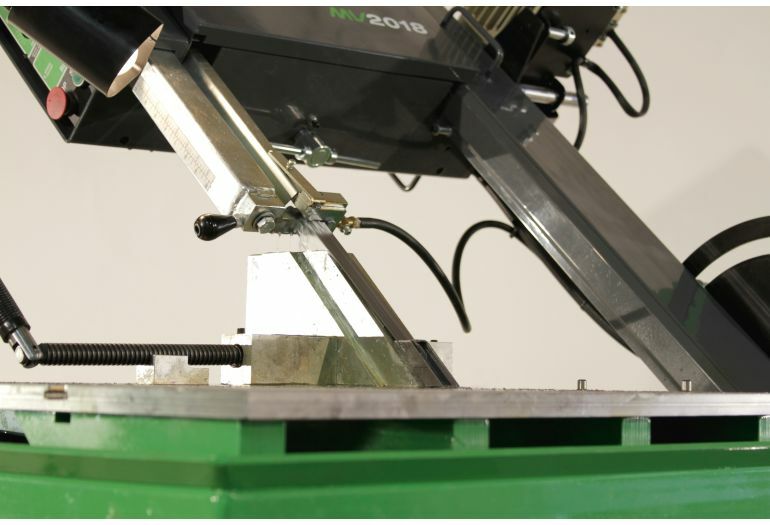 By using an automated saw for first processes on most basic materials, the MV2300 is used primarily for secondary cuts and fabricating specialty pieces for mower components that are unable to be completed by the automated saw. “The automated saw is used for higher quantity, simple parts,” said Beavers. “The smaller quantity or more uniquely required parts are manufactured on the MetalMizer.” The MV2300 operates in full production mode during two shifts, five days a week cutting a variety of angles of solid square stock, tube, hex, and channel before moving onto further fabrication. With a cutting a capacity up to 18” wide and 20” high, the MetalMizer machine also features six foot infeed and outfeed tables in order to accommodate long material. Pieces run through the MetalMizer saw eventually become key components on Lastec mowing equipment. Throughout their history, MetalMizer saws have provided Lastec with the versatility, ease of use and flexibility required to engineer and manufacture specialized parts for their unique products. 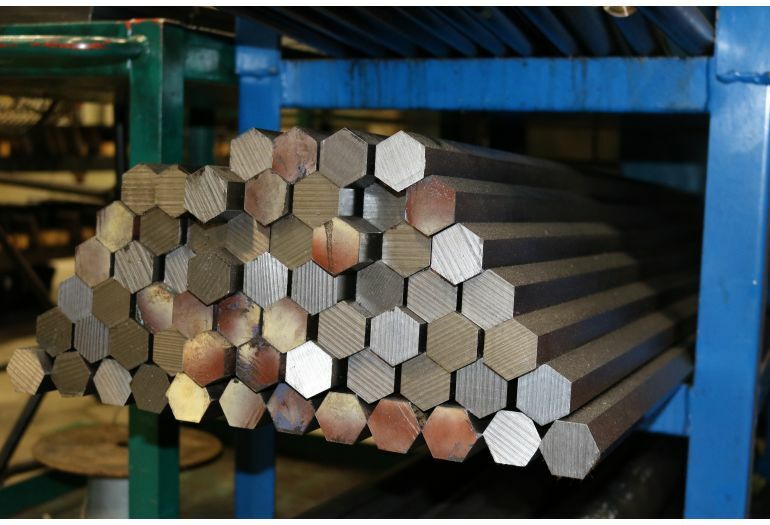 Partnering with MetalMizer has also enabled Lastec to manufacture and introduce new innovative products to the market over the years. For the future, Lastec looks to continue expanding and improving their product range with high-quality turf and lawn equipment built in the USA.